If the dream of a few Frenchmen in the seventeenth century had been realized, the continent of North America would have become a vast French empire. The magnificent project apparently had every prospect of success, and for over a generation was more than a possibility. The King, Louis XIV, had a boundless ambition; served by capable soldiers and statesmen, for the greater part of his long reign he dominated Europe: government was concentrated in himself , and his projects were carried out with an organized efficiency and supported by resources greater than those of any other power of his time. When he came to the throne, his colony in Canada consisted of a handful of. traders, missionaries and settlers scattered in a few isolated posts along the St. Lawrence. 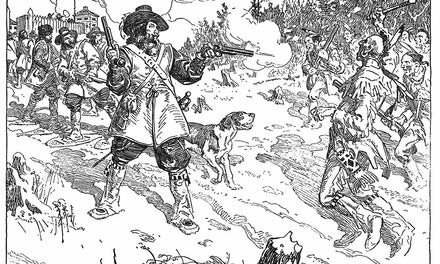 For years it had been the prey of commercial companies who cared only for the profits of the fur trade, and neglected or discouraged the permanent settlement which they were pledged to support. and followed to its mouth, something of the prairie country became known. Gradually the idea grew in the minds of the explorers and the governors of Canada that a continuous chain of French settlements should be extended from Acadia to the Gulf of Mexico. Some, like La Salle and Frontenac and the Intendant Talon caught a glimpse of the possible future, and the idea became a policy, a plan that appeared feasible. Along the Atlantic seaboard were sprinkled the English colonies, each leading its own isolated life, indifferent to its neighbours and immersed in its own immediate interests, none extending any great distance inland, all more or less jealous of each other and of interference or control by the mother country. 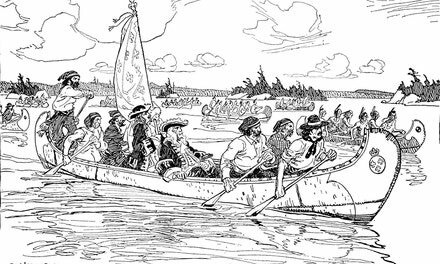 An organized and united New France circling around them would hem them in to a narrow strip along the coast and bar them from westward expansion. It was at Sault Ste. Marie that the first steps were taken to put the plan into operation, and a ceremony was performed which announced this ambitious programme. In 1670, a French officer, Daumont de St. Lusson, with a small party, was sent to take formal possession of the whole country around the Upper Lakes and along the great river, not yet discovered, and known only by hearsay, which to-day is called the Mississippi. 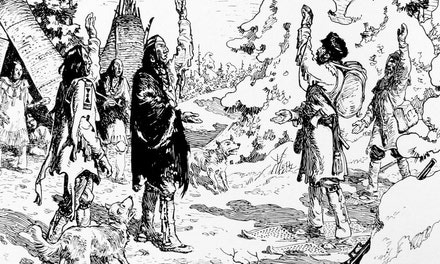 St. Lusson spent the winter on Manitoulin Island, sending messengers to the neighbouring tribes to invite them to meet him in the spring at the Sault Ste. Marie, where the Indians were accustomed to gather every year to catch fish in the rapids. Here, on the 14th of June, I671, St. Lusson, with his company of soldiers and coureurs de bois, and the Jesuits of the near-by mission, met a great crowd of Indians, gathered from fourteen different tribes. On the hill above the foot of the rapids, a large cross was set up and a cedar post erected beside it, bearing a metal plate engraved with the King's coat of arms. The cross was blessed by the priests, and the company sang hymns and prayed for the King, Then St. Lusson, holding a sod of earth in one hand, the ancient symbol of taking possession of the land, and raising his sword, proclaimed Louis XIV King of "all the country bounded by the seas of the North, the West and the South" - a claim inclusive enough to satisfy the ambition even of the Sun King himself. The soldiers fired their muskets and shouted "Vive Ie Roi," while the Indians yelled and whooped. The ceremony ended with a long speech by Farher Allouez, in which he glorified the great King and boasted of his wealth and power. "He is the chief of the greatest chiefs, and has no equal on earth," said Allouez. "All the chiefs you have ever seen are but children beside him. He is a great tree and they are but the little herbs that you walk over and trample underfoot. When our King attacks his enemies, he is more terrible than the thunder: the earth shakes; the air is all on f ire with the blaze of his cannon; he is seen in the midst of his warriors covered with the blood of his enemies, whom he kills in such numbers that he does not reckon them by the scalps, but by the streams of blood which he causes to flow." Truly an appropriate occupation for the Most Christian King, as Louis was officially styled. "Men come from every quarter of the earth to listen to him and admire him. All that is done in the world is decided by him alone. In his cities are storehouses where there are hatchets enough to cut down all your forests, kettles enough to cook all your moose, and beads enough to fill all your lodges. His house is longer than from here to the top of the Sault, and higher than your tallest trees; and it holds more families than your largest town." The whole performance was a typical example of the skilful methods of the French in dealing with the Indians by presenting an impressive spectacle and satisfying their love of oratory and ceremonial. Nevertheless, no sooner had the white men departed than the Indians tore down the royal arms, which doubtless they regarded as a magical sign which might bring evil upon them. Perhaps, we may regard its destruction as an omen of the fate of French ambitions on this continent. It is interesting to speculate how the history of North America - of Europe itself - would read to-day had the great idea been carried into accomplished fact, and the King's claim made good by persistent and energetic action. But Louis XIV turned from whatever dreams of an American empire that had visited him to plans for European power which involved him in war, and led him and France to disaster. St. Lusson holds in one hand a sod of earth. This was part of the procedure in taking possession of land. This ceremony was performed by discoverers and often also by seigneurs on entering on territory granted them by the king. Sometimes a twig taken from a tree was used as a symbol. 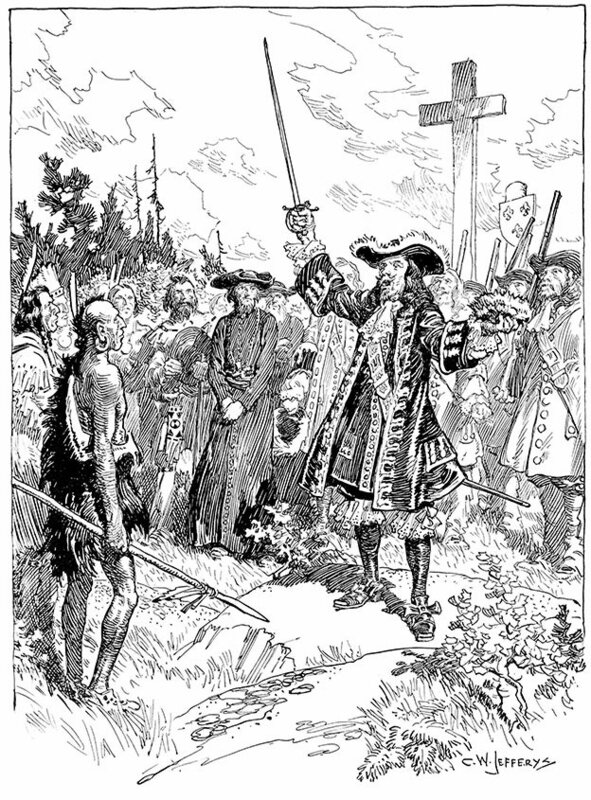 Explorers frequently marked the ownership of their sovereign by erecting a cross, as did Cartier, or by burying an inscribed metal plate, like La Verendrye. St. Lusson, in addition to taking the sod, put up a cross bearing a metal plate engraved with the King's arms. The rights of the native inhabitants to their country were ignored, and it is doubtful whether, during the French regime, any treaty was made with the Indians which included a purchase or a formal surrender of their lands. Wetherell, J.E. Three centuries of Canadian story from John Cabot to John Franklin. Toronto, Musson, 1928. 338 p. llus. Walker, Paul. C.W. Jefferys and images of Canadian identity in school textbooks. Kingston, Ont., Queen’s University, 1990. Masters of Art thesis.130 p. Illus. Wagamese, Richard. “The power of the cross.” In Toronto Star, March 26, 1991, p. A23. Illus. “Religion and power: explorer d’Aumont St. Lusson at the Soo in 1671, declaring the West a French possession. Unwin, Peter. The wolf’s head: writing Lake Superior. Toronto, Cormorant, 2008. 254 p.